New Blue Wave support appears in Divine Dragon Caper. Auto (RC): [Soul Blast 1] When your Grade 3 or higher Vanguard with “Blue Wave” in its card name attacks, you can pay the cost. If you pay it, choose another of your Vanguards and Rear-guards, during that turn, those Units and this Unit gain Power+2000. Auto: [Counter Blast 1 & Soul Blast 1] When this Unit is placed in (RC), if there are 2 or more cards in your (VC) who have “Blue Wave” in their original card name, you can pay the cost. If you pay it, choose 1 of your other Units. During that turn, that Unit and this Unit gain Power+4000. “Blue Wave Marine General, Damia” has an ability that when your Grade 3 or higher “Blue Wave” Vanguard attacks, that grants itself, your Vanguard and 1 of your other Rear-guards 2000 Power. By making its Power 11000, it can Hit with its attack all on its own. And since “Blue Wave Marshal Dragon, Tetra-boil Dragon” and “Blue Wave Dragon, Tetra-drive Dragon” both can attack twice, that means you can Power Up twice! Strengthen your Units to pull off even more explosive attacks. “Blue Wave Soldier, Kimon” has an ability that activates if both your Heart and G Unit are originally “Blue Wave”! So Stride “Blue Wave Marshal Dragon, Tetra-boil Dragon” on top of “Blue Wave Dragon, Anger-boil Dragon”. When it appears, it and another of your Units gain 4000 Power! Since Kimon’s Power becomes 11000, you can expect it to be an incredible attacker. 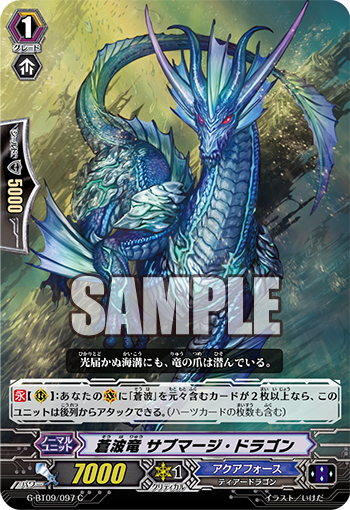 “Blue Wave Dragon, Submerge Dragon”, if your Heart and G Unit are originally “Blue Wave”, becomes a Unit that attacks from the back row. If Kimon grants it 4000 Power, it can attack the Vanguard all on its own. So you can increase your opponent’s problems by attacking from the back row! Besides the cards introduced today, “Divine Dragon Caper” includes other “Divine Dragon Caper” cards, so you’ll have plenty of fun! Today’s “Weekly Vanguard News Bits NEXT” will be introducing an 《Aquaforce》 ace card Unit from “Divine Dragon Caper”! We’ll also be introducing cards from SP Clan Pack, so be sure to remember to check out things at 9 PM! !